1964 Ad for Wrestling on WGHP-8 in High Point NC. 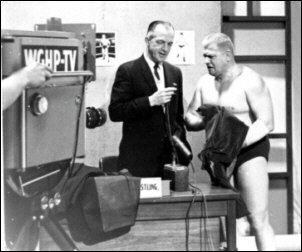 In February 1964, WGHP began airing Championship Wrestling on Saturday evenings. The show was filmed (later taped) at the WGHP studios on the second floor of the Sheraton Hotel on North Main Street in High Point NC. The host was WGHP news and sports personality Charlie Harville, who became a broadcasting institution in North Carolina and would become only the second sportscaster inducted into the North Carolina Sports Hall of Fame. It was Harville who spoke the first words on the new station when it first went on the air four months earlier on October 14, 1963. The studio was very small, and as a result had a smaller ring, so much so that Tex McKenzie once complained to Harville it was not large enough for him to properly and effectively execute his bulldog headlock! But the cozy atmosphere defined what made studio wrestling so special during this era. 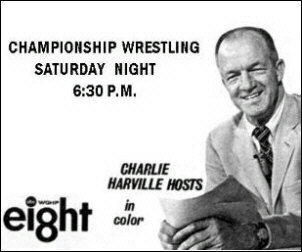 Behind Charlie Harville's desk, photos and event posters would be taped to the wall and the camera would zoom in on them when Harville would run down the card at the beginning of the show or when doing local promos. 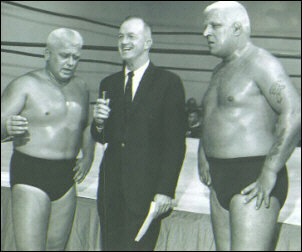 The WGHP program was enormously popular, and supported the regular cards in Winston-Salem, Lexington, and the huge shows in Greensboro. The market area for the show was actually the three city TV market of High Point, Winston-Salem, and Greensboro, but the signal stretched northward across the Virginia border and as far east as Raleigh. During its 10 year run, it was the only Crockett Wrestling show in the Winston-Salem/Greensboro/High Point market. The Raleigh taping of Mid-Atlantic Wrestling did not begin airing there until after the IWA closed shop, and Jim Crockett took their TV time on WXII-12 out of Winston-Salem. Championship Wrestling aired at 6:30 p.m. on Saturday evenings for most of it's 10 year run on WGHP. There was a brief period of time in the fall and winter of 1966 when the show was split in to two 30 minute programs airing at 7:00 PM and 11:00 PM on Saturday. And in an odd scheduling move, the show aired at 6:00 p.m. on Friday night from September 1967 to February 1968. Color Commentators: No regular color commentators. Different wrestlers served as color commentators throughout the run. 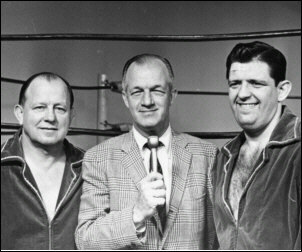 (L) A promotional photograph of George Becker, Charlie Harville, and Johnny Weaver at WGHP TV in High Point, NC. 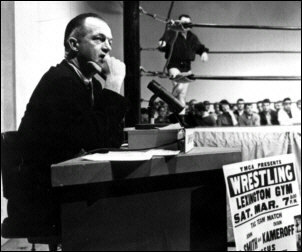 (R) Harville waits at his broadcast position to return to the air during a commercial break on Championship Wrestling. 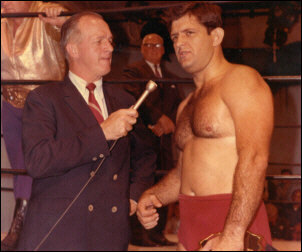 (L) Charlie Harville interviews Southern Heavyweight Champion Johnny Weaver. Rip Hawk, one half of the Atlantic Coast Tag Team Champions, is over Harville's right shoulder. 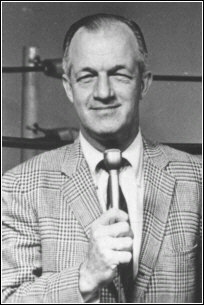 Wally Dusek is seen waiting to do the ring introductions in the ring. 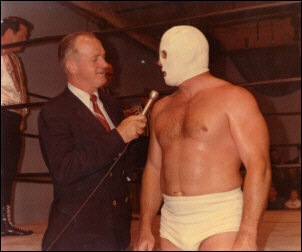 (R) Harville interviews Mr. Wrestling Tim Woods. Not sure who is in the ring. 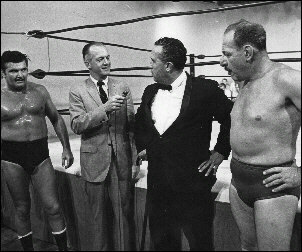 (L) Host Charlie Harville interviews manager Homer O'Dell and his team of Bronco Lubich and Aldo Bogni. (R) Wahoo McDaniel chops Johnny Valentine in an impromptu battle in the WGHP studios. It was Wahoo's first appearance on WGHP as he prepared to enter the territory full time in 1974. (Top L) TV Guide ad from 1960 for the local news broadcast on WFMY TV 2. 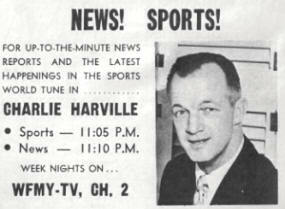 The ad features Charlie Harville who was at channel 2 before going to channel 8. 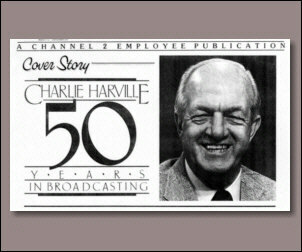 (Top R) An image from a WFMY employee publication celebrating Charlie Harville's 50th anniversary in broadcasting. (Bottom L) A TV Guide ad from 1967. Notice the announcer is featured in the ad for a wrestling show. Charlie was always as big a star as the wrestlers, although he never tried to be. The fans just made him that way. 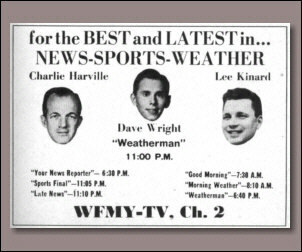 (Bottom R) An news/sports ad for WFMY-2 in Greensboro from a 1959 TV Guide featuring a young Charlie Harville. 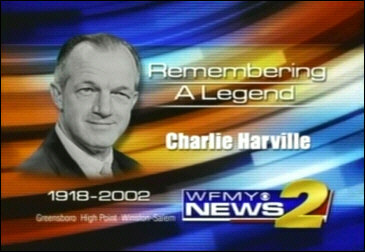 following the death of Charlie Harville in 2002. Special thanks to Wayne Brower and the family of Charlie Harville who made substantial contributions to this feature. Thanks also to Carroll Hall and Brad Anderson for their assistance, support, and inspiration. The station began operation in 1963, and it was owned by Southern Broadcast Company. It was originally the Piedmont Triad's ABC affiliate. Harte Hanks Broadcasting's purchase of Landmark Television in 1977 resulted in the company owning both WGHP and WFMY-TV, and WGHP was consequently sold to Gulf Broadcasting in 1978. WGHP was owned by Gulf Broadcasting until 1984, when it was acquired by Taft in a group deal. Great American Broadcasting purchased other Taft properties in 1987, but Taft would keep WGHP until 1992 when Great American bought the station as well.